I can't remember the last time I got to hang out all day in Gainesville without an event to go to. Usually we are there for a Gator game of some sort, which, don't get me wrong, is awesome. But that usually entails tailgating, game watching and then heading home, with not much time to reminisce. Well, Saturday was all about reminiscing and making new memories. I had a blast. We met my dad and his wife Vicki to kick things off so that they could meet Hilty. She was so excited to see them and we had a great time visiting. We also headed to do a little business and sign on the dotted line to inherit my grandparents' house in Palatka. We are so excited and honored at this opportunity and can't wait to share that journey with you as it unfolds. My inner Joanna Gaines is starting to come alive...stay tuned! After all of the paperwork we headed to a Gainesville landmark and ate lunch at Leonardos Pizza. This delicious Chicago-style pizza in the pan was delicious and tasted just like it did all those years ago. So good. With a full belly we said goodbye to dad and Vicki and then headed out to do a little exploring, which is by far our favorite thing in a new (or old) city. Our first stop was Devil's Millhopper Geological State Park which is just down the road from Leonardo's. "Devil's Millhopper is a National Natural Landmark that has been visited by the curious since the early 1880s. Researchers have learned a great deal about Florida's natural history by studying fossil shark teeth, marine shells and the fossilized remains of extinct land animals found in the sink. The sinkhole is 120 feet deep and 500 feet across. A one-half mile nature trail follows the rim, and there is a 232-step stairway to the bottom of the sink. The state purchased this site in 1974, and the stairs were completed in 1976. Until that time, access in the area was limited." I knew Everett would love all of the steps and Mike, being a "nature boy" as I call him, would find it very interesting. The park was bustling with activity and is a popular place for walkers to use the nature trail and stairs for exercise. Hilty did great in the backpack for the first time and we didn't see any venomous snakes...so all in all, I call that a win. Since our calves were burning from all of the climbing, we decided to head towards campus just as the UF basketball game ended, in which the Gators beat #9 West Virginia handily. Once we arrived we found plenty of parking across from the stadium. Ben Hill Griffin Stadium is one of my favorite places in the entire world. I have so many amazing memories there and couldn't wait to show Everett "Albert's House". I found it only fitting since he had a private tour of "Bucky's House" a few summers ago in Madison (thanks again Katie!). Everett at 8 months (left) and at almost 3 years (right). We didn't have a private tour set up, but the stadium is open to the public every day of the week and except for running on the field, you can explore as much as you would like. There were lots of people touring, taking pictures and running the stadium steps. To me, there is nothing like being in the stands for a home Gator game, but I must say, it was pretty spectacular to be in The Swamp on an off day, too. The place is just magnificent. We took tons of pictures and we even climbed up to the very seats that made me fall in love with the Gators all those years ago. 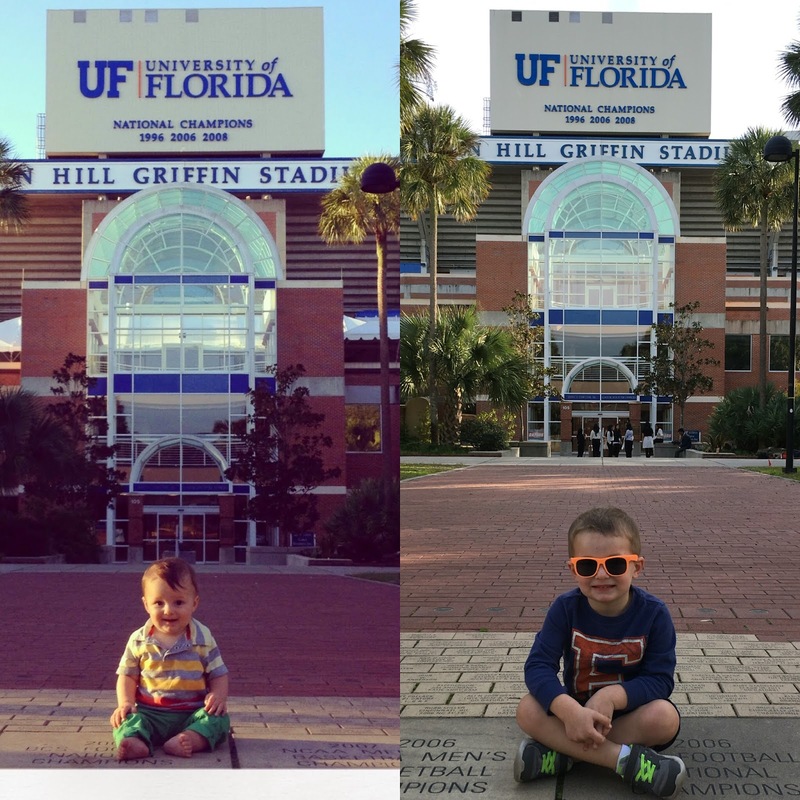 Both of my parents are UF Alums and always had season tickets since their college days. They had an extra seat for me and I started going to games when I was 9; the same year that Steve Spurrier started. My memories of Saturdays in Gainesville most always involve big family gatherings either before or after the game and watching the Gators win. If it wasn't football season we were still always around campus going to volleyball, basketball, baseball games and gymnastics meets. I think I really do bleed orange and blue. I have to give kudos to Mike. He is definitely not the biggest Gator fan in the world, but knows how much it means to me. He was a great sport this weekend and played along with my every move and smiled for every picture. He's a keeper. As for this week...it's a big one! Everett turns 3 on Thursday and I truly don't know where the time has gone. We are so blessed to get to be his parents and are so thankful that we get to watch him grow up every single day. I'm sure this week will be a fun and busy one, but I know Mike and I both will be reflecting on all of the amazing times we have had and hope to have with our little guy.